Polish Obsessed: Oh, It's Real Alright! 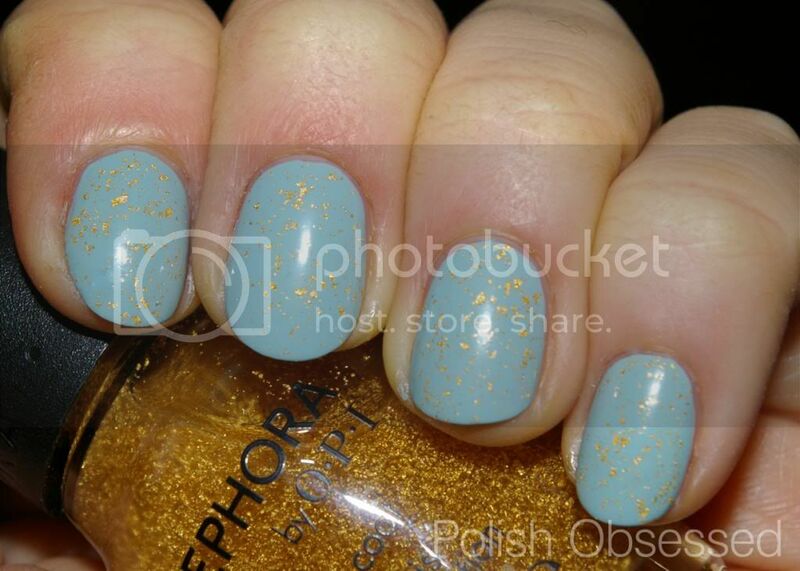 Today I have a quick and easy mani refresh with one of my newly acquired (and discontinued) Sephora by OPI top coats. Surprisingly I almost left this polish behind, and it's the first once I choose to wear! Of course, right? My base is China Glaze Kinetic Candy, a lovely, dusty blue pastel. 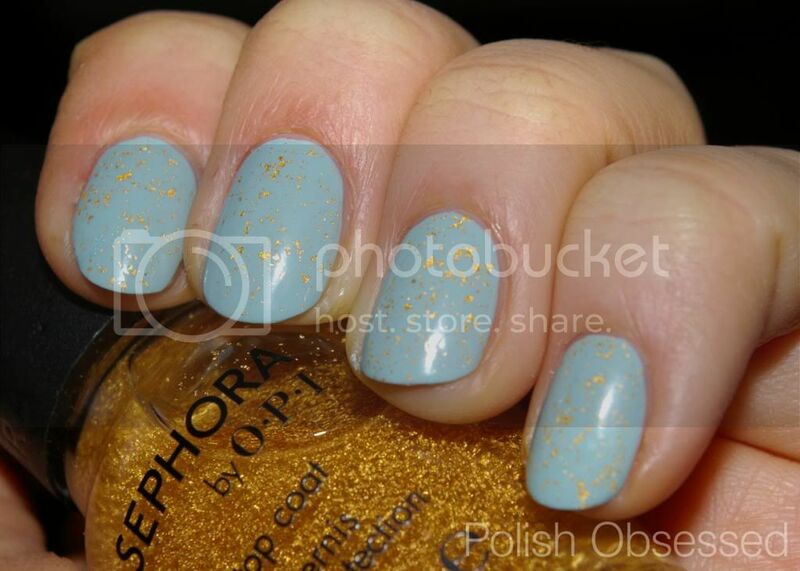 And the topper of choice is Sephora by OPI It's Real 18K Gold Top Coat. 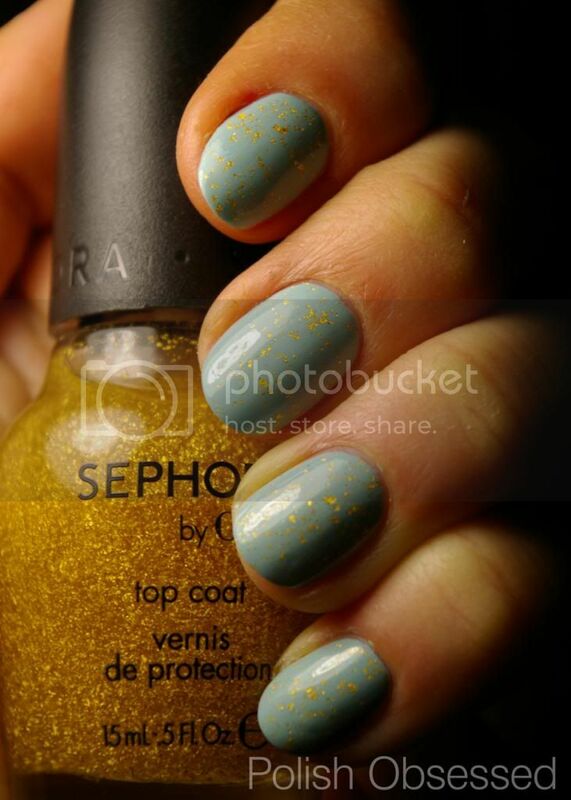 In my photos below I used two coats of the fold flakie top coat, which is made up of real gold fragments. You may also notice that it is very subtle, the gold pieces are very tiny for the most part. I really like the contrast between the soft, diluted blue and bright shiny gold. I''m not really a huge fan of yellow gold, but in small amounts, it works! I do wish the gold flakies were a bit more dense so that I could achieve the look of two coats in one. Other than that, I am really a fan of this polish. That means a lot considering I had intentions of gifting or selling this polish. Super happy I purchased it an tried it out :) That being said, I would probably not pick it up if it was sold at original price due to the low density of gold pieces per coat of polish.